Fastcall > Training Resources > User Guide > Module – Troubleshooting > Unit – Get help! 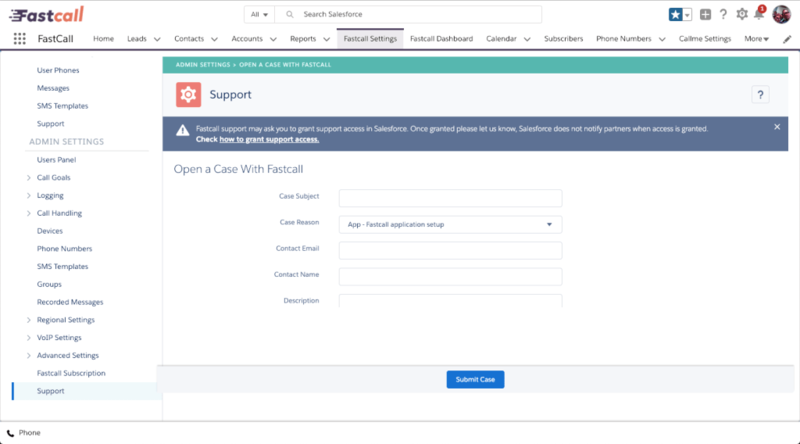 This unit shows you how to open a ticket with Fastcall and grant Fastcall support access to your Salesforce org. Salesforce allows you to grant limited access to your Salesforce account to package developers such as Fastcall. We may need this to help with trouble shooting or setup – it generally speeds things up to grant access when opening a ticket with us! Before opening a ticket with us, check with your Fastcall administrator – even if they’re not able to help, they need to know about any issues you’re having! You can open a ticket with Fastcall by going into Fastcall settings, choosing the ‘support’ tab, and filling out the form. Try to be as accurate as you can when describing your problem – because Fastcall is Salesforce native, we aren’t able to see inside your org until you give us permission, and even then it’s a bit limited. It might help to send us a screenshot, too (just reply to the email you get when the ticket is opened). 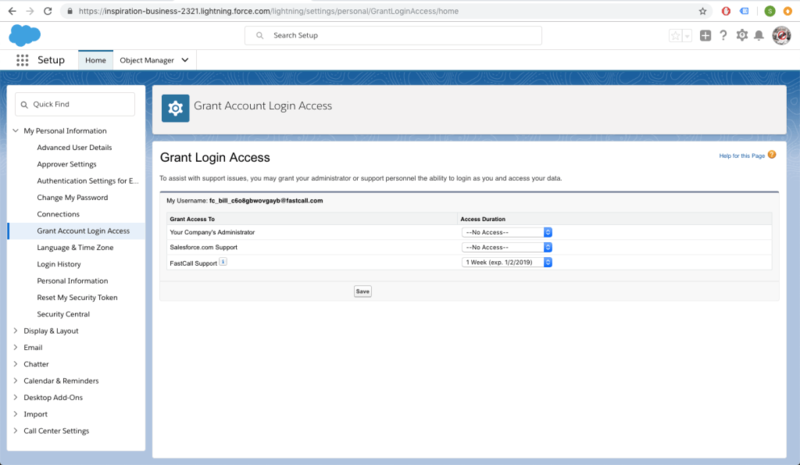 In your Salesforce user settings search for ‘Grant Account Login Access’. Set the access period for ‘Fastcall Support’ to ‘1 week’ (suggested – 1 day might not be enough to close the ticket) and click ‘Save’. This doesn’t notify Fastcall support, so you may also want to do that separately.